Cougar values are: <strong>RESPECT, PARTICIPATION, TEAM and GROWTH</strong>. We are a community-based organisation providing our local youth with the support and facilities to learn, play and enjoy football. We aim to be the best possible place for kids to: <ul> <li>learn and play footy</li> <li>learn values like discipline and respect and teamwork</li> <li>build fitness, and</li> <li>create lasting friendships.</li> </ul> Our history dates back to 1952 and we play in the Northern Football League. Our club song, "<a title="Team Song" href="http://njfc.com.au/?page_id=230">Good Old Northcote Forever</a>", is sung to the tune of the Collingwood anthem. We are affiliated with both Northcote AusKick and Northcote Park Football Club. As with all community-based amateur sports clubs, we are an organisation managed and run by dedicated <a title="Volunteer" href="http://njfc.com.au/?page_id=127">volunteers</a> working within a structure governed by our club <a title="Policies & Official Documents" href="http://njfc.com.au/?page_id=152">constitution</a>. The <a title="Committee and Officials" href="http://njfc.com.au/?page_id=19">management committee</a> is elected by members. One parent becomes a member when their child joins the club; additional social memberships are also available. We have the top level of Australian Football National Risk Protection Programme <a title="Insurance" href="http://njfc.com.au/?page_id=159">insurance policy from Jardine Lloyd Thompson</a>. 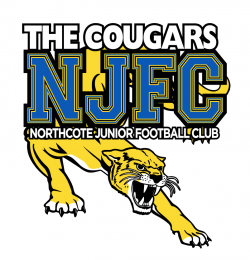 Northcote Junior Football Club (NJFC) runs junior football competitions on Sundays for players (boys and girls) aged 7-17. Follow this link to register for an NJFC cougars team. For footballers aged 5-12 we run Auskick on Saturdays, 9-10.30am. 2019 is here and the football season is just around the corner. Our training program has commence and is full swing for all teams. Refer Training times on this website, NJFC Team App or Facebook. In 2019 we will again field all-girls teams, as well as mixed/boys teams starting from U9. Click the link for information on coaching appointments for 2019. Training for all teams in 2019 Starts this week – stay up to date via this site & NJFC Team App. Details on when and where your team is playing. Register your child for boys or girls football in a Cougars team. Find the contact details for coaches and team managers. The boys football program is well known and has over 10 teams. The girls program at NJFC had three teams in 2017 and is set to grow in 2018 and beyond. Read more about the Auskick program at Northcote. This program engages with children from disadvantaged backgrounds to give them the opportunity to participate in community sport. How the numbers stack up! Northcote Junior Football Club is grateful for the support from our sponsors. Click to register your child as a player for Northcote Cougars or in the Auskick program.